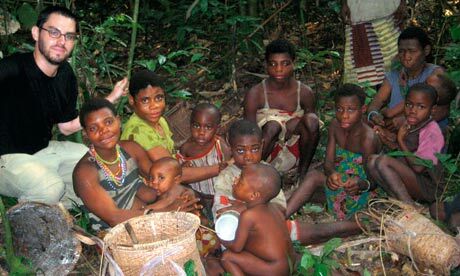 For my next long-term project, about the last hunter-gatherer societies, and what they can teach us, I’ve been spending time living with Mbendjele pygmies in the Republico of Congo. Here’s a piece I wrote for the Guardian Magazine about how I learned Lingala (or at least memorized the entire dictionary), using Ed Cooke’s web app, Memrise. One of the great challenges of our age, in which the tools of our productivity are also the tools of our leisure, is to figure out how to make more useful those moments of procrastination when we’re idling in front of our computer screens. What if instead of tabbing over to the web browser in search of some nugget of gossip or news, or opening up a mindless game such as Angry Birds, we could instead scratch the itch by engaging in a meaningful activity, such as learning a foreign language? If five million people can be convinced to log into Zynga’s Facebook game Farmville each day to water a virtual garden and literally watch the grass grow on their computer screens, surely, Ed believes, there must be a way to co-opt those same neural circuits that reward mindless gaming to make learning more addictive and enjoyable. That’s the great ambition of Memrise, and it points towards a future where we’re constantly learning in tiny chunks of our downtime.